‘A Beautiful Life’ was the name of the film made about the South Korean potter Kang Hyo Lee. His traditional ceramic practice was beautiful in its simplicity, as was his studio life in rural South Korea, at the foot of a mountain where he would meditate. On the advice of his Japanese friend he loosened up his rigid pot building technique by applying a slip decoration as a performance, accompanied by drumming. Making Futures brings together contemporary crafts people around the issue of sustainability and modernity. We watched Lee’s film a week before attending Plymouth College of Art’s Making Futures Conference. The anticipation grew as the pot got bigger over the course of the first day of the conference. 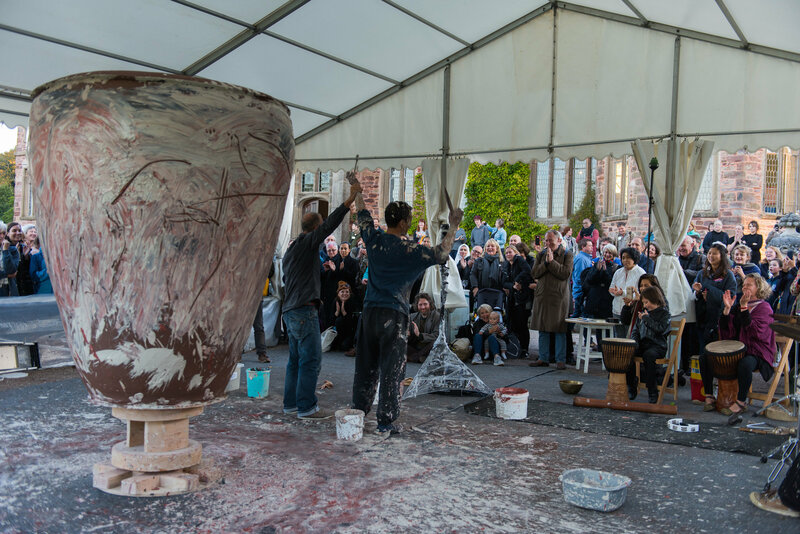 By lunchtime the enormous pot was nearly finished and Kang Gho Lee was preparing for his performance. Meanwhile inside the delegates were in groups listening to speakers from all over the world reflect on contemporary challenges and how creative craft practice can be the answer. In the Leadership strand I heard about amazing sewing workshop in Stroud called Atelier, about the history of craft guilds and an inspiring maker practice of opening up new realities to dream for different futures. I paused to reflect on my own journey with Om Padma, of working with material and sustainability. And on how that had also now transformed into something else. The sun was shining as we headed out onto the drive in front of Mount Edgecombe estate, with a view across the Tamar to Plymouth beyond. The drumming started and we gathered around the giant pot. He picked up a scoop of white slip and slung it onto the pot as it turned on the wheel. Again he splatted the slip across the pot. He ran his hand through the slip as the pot turned. From top to bottom. More slip, this time a darker colour, Kang Hyo Lee gestured at the drummers to pick up the pace. Fluidly he threw, mixed and wiped the slip on the pot to the beat of the drum. The energy was captivating: so immediate, so present. No doubt, a Master. See Kang Gyo Lee’s work at the V&A exhibition on Contemporary Korean Ceramics.